Objectives: Few studies of smoking and cervical carcinoma have addressed the rare cervical adenocarcinomas or used DNA-based tests to control for human papillomavirus (HPV) infection. Methods: This multicenter case–control study included 124 adenocarcinoma cases, 307 community controls (matched on age, race, and residence to adenocarcinoma cases), and 139 squamous carcinoma cases (matched on age, diagnosis date, clinic, and disease stage to adenocarcinoma cases). Participants completed risk-factor interviews and volunteered cervical samples for PCR-based HPV testing. Polychotomous logistic regression generated adjusted odds ratios (ORs) and 95% confidence intervals (CIs) for both histologic types. Results: Eighteen percent of adenocarcinoma cases, 43% of squamous carcinoma cases, and 22% of controls were current smokers. 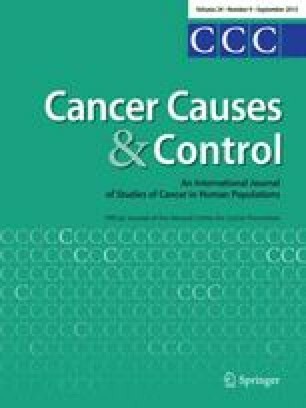 After control for HPV and other questionnaire data, adenocarcinomas were consistently inversely associated with smoking (e.g. current: OR = 0.6, 95% CI 0.3–1.1; ≥1 pack per day: OR = 0.7, 95% CI 0.4–1.3), while squamous carcinomas were positively associated with smoking (e.g. current: OR = 1.6, 95% CI 0.9–2.9; ≥1 pack per day: OR = 1.8, 95% CI 1.0–3.3). Results in analyses restricted to HPV-positive controls were similar. Conclusion: Smoking has opposite associations with cervical adenocarcinomas and squamous carcinomas. Although both histologic types are caused by HPV and arise in the cervix, etiologic co-factors for these tumors may differ.